A well known bible teacher made this remark: “Life would be simple if it were a choice between good and bad. But typically, it is a choice between “good” and “best.” One biblical story that immediately came to my mind when I thought about “good” and “best” was the account in Luke 10 about the day Jesus was invited into the home of Martha, Lazarus’ sister. Martha was upset that her sister was not helping her with the preparation of the meal and brought her complaint to Him. Jesus responded: “Martha, Martha, you are worried and upset about many things, but only one thing is needed. Mary has chosen what is better , and it will not be taken away from her.” (verses 41-42) To be more correct, in this instance it was a choice between “good” (Martha's part) and “better” (Mary's part) but I trust you get the idea. In the early days of my ministry, a well known area pastor called me on the phone to invite me and our church to join them in a city wide rally against abortion, suggesting that no one could consider himself a decent bona fide preacher of the gospel if he did not take part in this worthy cause. I declined simply because I was not convinced this was something our church needed to get involved in at the time. I knew then much less than I know now but I quickly recognized it as a choice between “good” and “better, the "good" being the cause and the "better" staying in the calling of God for my life. (tending to my own flock) My feeling was confirmed when I later found out that things happened in that rally where certain “Christians” behaved themselves more like the children of the devil, which resulted with the media outlets criticizing the churches involved and their overzealous members. 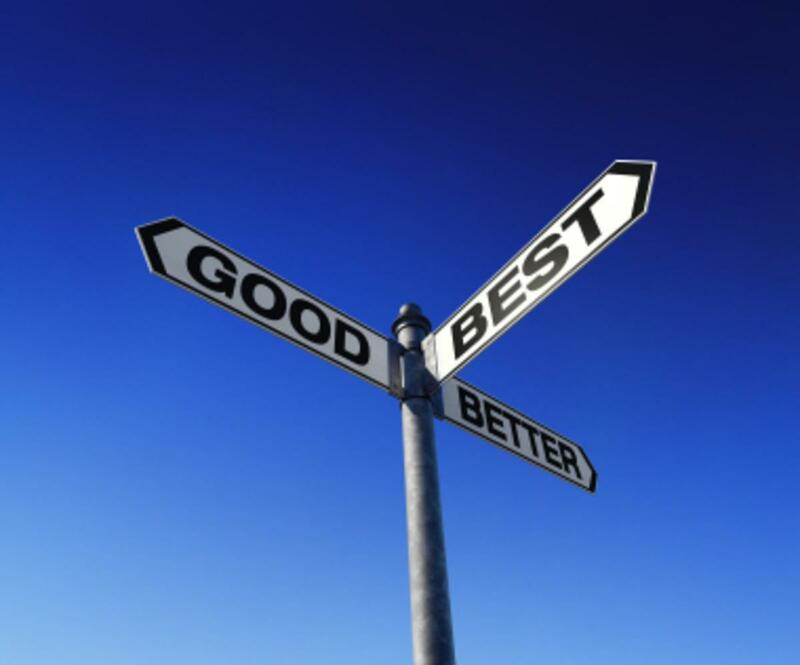 Besides choosing between good and bad, all of us are constantly faced with deciding between “good” and “best.” Pastors deal with this situation often. They hear members say they were not in church because they rather chose to do such things as visit a sick friend or family member, go pass out gospel tracts, entertain their out-of-town guests, or catch up on some needed chores around the house, etc. Now, all of these are good, even noble, things, but why did they choose to do them on the Lord’s time and not on their own? Of all the time frames that were available to them, why did they choose to do these things on a Sunday morning between 10 AM and 12 noon or on a weekday church night between 7-9 PM? Dear child of God, ask the Lord to help you distinguish between the good, bad, better, or best the next time they confront you, and for the grace and courage to choose your best option. Many people around you will never know when you chose one over the other, but you and the Lord will always know when you chose correctly.